Please note our 2018/19 Holiday Hours and plan well in advance for refills. Thank you for your business and we look forward to a wonderful holiday season! 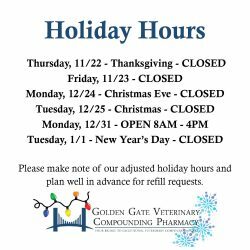 This entry was posted in General, Pharmacy Hours and tagged holiday hours, holidays, pharmacy hours, refills. Bookmark the permalink. ← We are Novato Proud! Very well written story. It will be helpful to everyone who usess it, including yours truly :). Keep up the good work – looking forward to more posts.